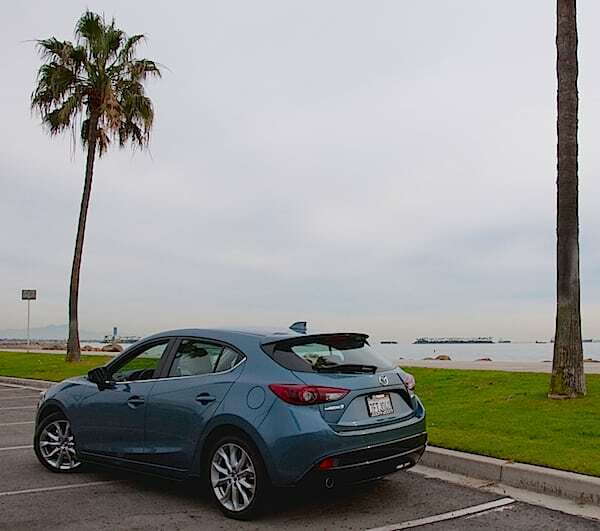 CarNewsCafe spent a week behind the wheel of the 2015 Mazda3 Skyactiv. What we found is a car with a very distinct attitude. But perhaps, most importantly, the Mazda3 Skyactiv is where the company’s philosophy comes together in an elegant and pleasing way. 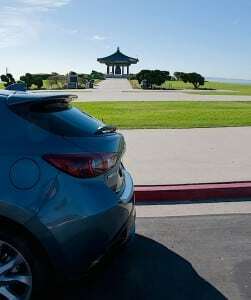 The Mazda3 Skyactiv is a very versatile car that feels at home almost anywhere. 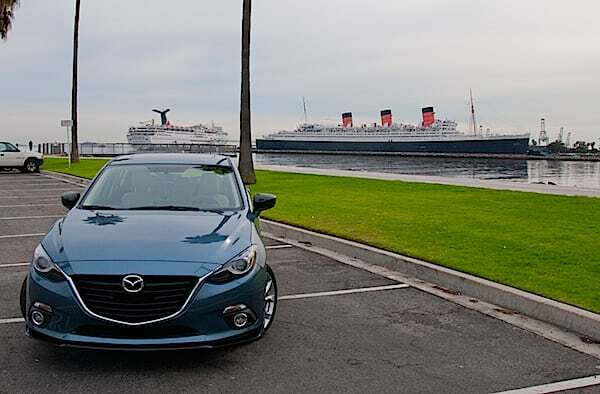 Whether stuck in traffic where the Mazda squeeze as little gasoline as possible from the tank to flat out highway where the engine happily revs, the Mazda3 felt it strikes the balance between fun, room for everyone, and versatility. 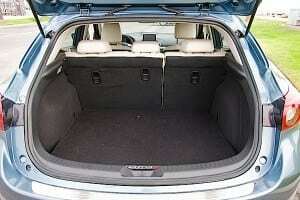 A car that surprised us last year was the Mazda6 Skyactiv we reviewed here. We wanted to see what Mazda could do with the Mazda3. The wait was well worth it. The Mazda3 Skyactiv is simply an excellent car where you feel the fruit of the company’s Skyactiv philosophy fall together perfectly. It delivers a solid and fun car to drive. 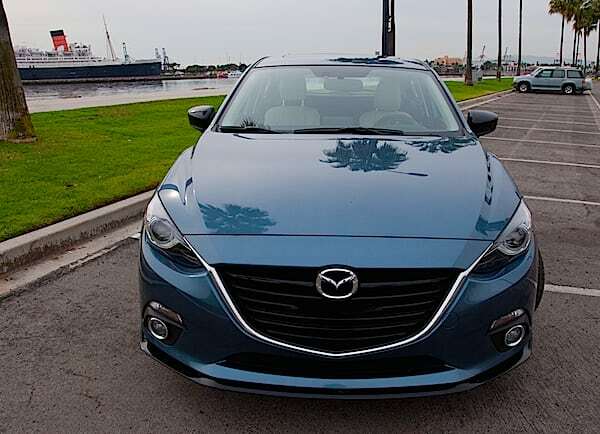 Although the previous generation’s design was attractive, we feel the newly redesigned Mazda3 includes plenty of personality and manages to integrate perfectly its new fascia grill, making it instantaneously recognizable. 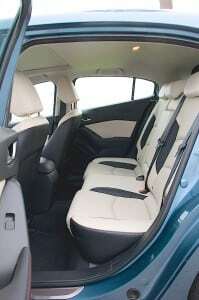 The interior doesn’t disappoint either with a futuristic feel that is both comfortable, ergonomic, light, and inviting. 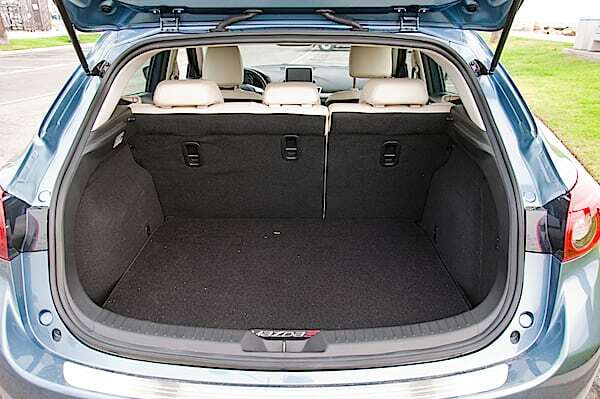 The back seats fold down offering a generous trunk, as you can see below. I have to thank my local STI Drive Experience here, Mark Duffus for insisting on making me drive one of these Skyactiv Mazda’s. The Mazda6 was a hit for my wife and I. An elegant sedan with good looks, decent performance at an unbelievable price. 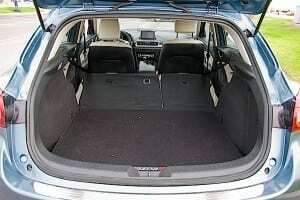 We discovered a refined, comfortable, affordable and gas frugal terrific sedan. 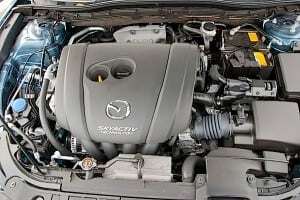 In order to squeeze as much fuel efficiency as possible, keep the engine between 1,500 and 2,000 rpm in traffic, and the Mazda will rival the best hybrids in its class. The Mazda3 Skyactiv has a nice tight feel that doesn’t punish you on bad road conditions. It’s a car that is alert, ready for a casual cruise, or to pounce and dash out traffic. The 2015 Mazda3 is nimble, which makes sense considering the company’s Skyactiv philosophy. So what is that philosophy? Mazda waged war on friction points, reduced weight, and overall impressive energy efficiency. You can read more here at Mazda’s official site. 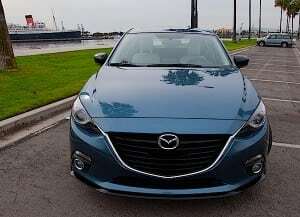 The six-ratio gearbox is great, as to be expected from Mazda, and exploited the engine’s power curve very well. I’m not a fan of automatic gearboxes for the type of cars, but Mazda manages to offer us an intuitive gearbox that seems to know what I need, when I want it.However, our test car here Our test car came with a regular manual transmission, which we enjoyed much. Honda Civic, Toyota Corolla, Nissan Versa, Ford Focus, Dodge Dart, and the Kia Forte we just finished test reviewing. Great handling, light steering feel, but stable. Great in traffic, at the limit of feeling it under revs. Great precise and well laid out gearbox. Instantaneous, crisp, light accelerations. A car you can drive using torque or pure horsepower. Clean interior that looks futuristic, but comfortable. 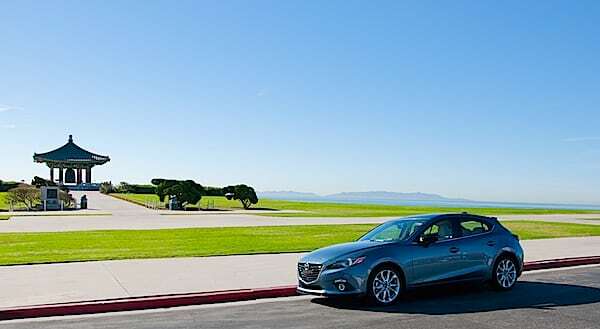 All of Mazda’s Skyactiv philosophy comes together in harmony in the Mazda3 Skyactiv. In the “if I had to nitpick” department, I would say the central elbow rest that covers the two USB inputs and the compartment within needs to be readjusted by moving either forward or back. I would chose back personally. 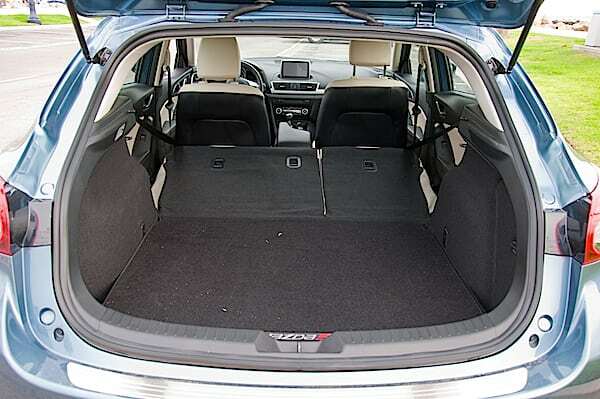 A fun, yet roomy car that is easy on the budget, gasoline, and still provides driving fun in a comfortable environment for everyone. Perhaps, this is the key point Mazda hits with brio. The Mazda3 is a great car for anyone, whether you have a family or not, it provides enough room and doesn’t skimp out on performance and handling. You really can’t go wrong with it. If electricity is not an option for your ride and you think hybrids are for weenies, then this is definitely the kind of car for you. 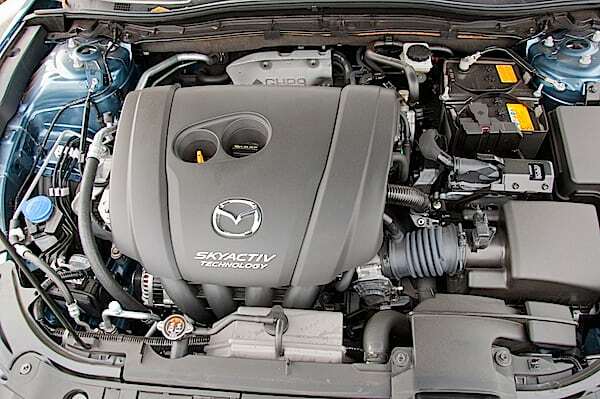 Click here for a PDF file on the Mazda3 Skyactiv’s specs. We had this car for seven days, in new condition. It was lent to us on behalf of Mazda via STI Drive Experience. Update: I drove my half brother’s brand new 2016 Mazda3 on German highways. The one test I couldn’t do in the US was to push the car fast on a highway. Mission accomplished. At 200+ Kph, the Mazda3 felt tight, responsive and doesn’t feel it was straining the mechanics much.